“The workshop is a bit like a living game in which participants are central players who create and then embark upon their own transformational journeys,” she says. “Participants play a key role in producing both the structure as well as content of the ritual, and the use of drama leads to colorfully improvised moments throughout. While I provide similar cues each workshop, what is created is one-of-a-kind and as vital as the community involved.” Past workshops she has facilitated focused on themes such as community relations, women’s empowerment, and life narratives. Her most recent workshop was held in Berkeley. Past participants in her workshops have come from countries such as Australia, the United Kingdom, the United States, Canada, Lithuania, Greece, the Netherlands and Malaysia. Now completing her training as a psychologist, Chandra believes that this project contains unique possibilities in clinical settings. “I think this method allows people to internalize the selected theme more deeply,” Chandra says. “Everyone is involved in the ritual, and because everyone is seeing their peers participate and be vulnerable, it pushes them to reveal more of themselves. Because nothing is pre-planned, people have no choice but to act spontaneously and be totally in the moment, which creates authentic engagement in the process." 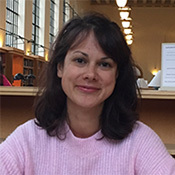 When asked about potential clinical populations for which this project may be useful, Chandra shared, “I think it is particularly powerful for anyone who feels like they haven't had a voice.” Other ideas she mentioned were themes surrounding peoples' relationships to anxiety, depression, body image, and grief. She has a particular interest in applying this project to the healing of women’s issues. In late March 2018, Chandra—accompanied by fellow Psy.D. student Sean Rose—presented her work at the Division 32 (Humanistic Psychology) Annual Conference entitled, “Liberation through Wisdom and Love: Humanistic Psychology, Social Justice, and Contemplative Practice” at Naropa Institute in Colorado. Her presentation summarized the results of an introductory study to this project.